Prosecco has long been one of our favorite alternatives to Champagne, and this delicious bottle is a great reminder of why. Light, dry, subtly citrusy, and endlessly drinkable, Scu Dò comes to us from a collection of small independent growers in Northern Italy's Valdobbiadene, a sub-region of the Veneto. We think it’s some of the best bubbly on the market: excellent for sipping, savoring, or toasting. Value hunters take note! This is one of the best values in the house bar none....and for good reason! I like to call Sco Do out house bubbly, but that is no put down. The staff loves it, our regulars love it and you will to. About $9 a bottle for terrific quality Italian sparkler which would cost close to $20 otherwise. At this price, grab a case and stock up for those unexpected guests this Summer! This sparkler pairs nicely with a tangy, salty cloud of cream such as La Tur cheese from the Piedmont region of Italy. Until recently, "Prosecco" could refer either to a wine or to a white grape. In 2009, however, the grape was renamed "Glera" in a bid to protect Prosecco's good name. Prosecco is usually a sparkling wine made by the Charmat method, though still versions do exist. Because it is so easy to drink, with or without food, Prosecco is a hugely popular choice for parties. 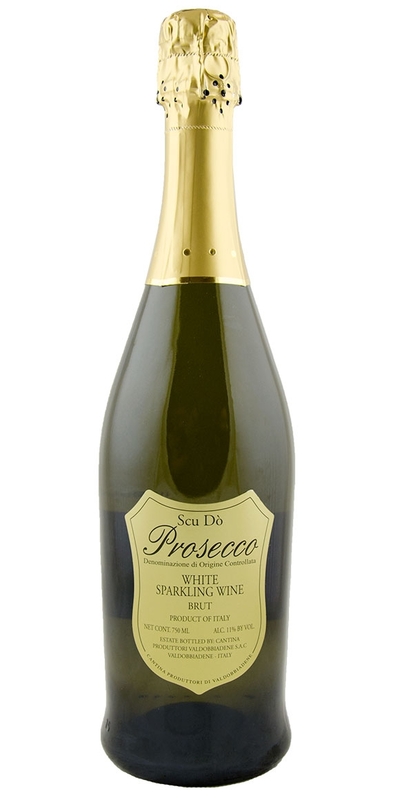 Notify me when Prosecco Brut, Scu Dò - NV is back in stock.